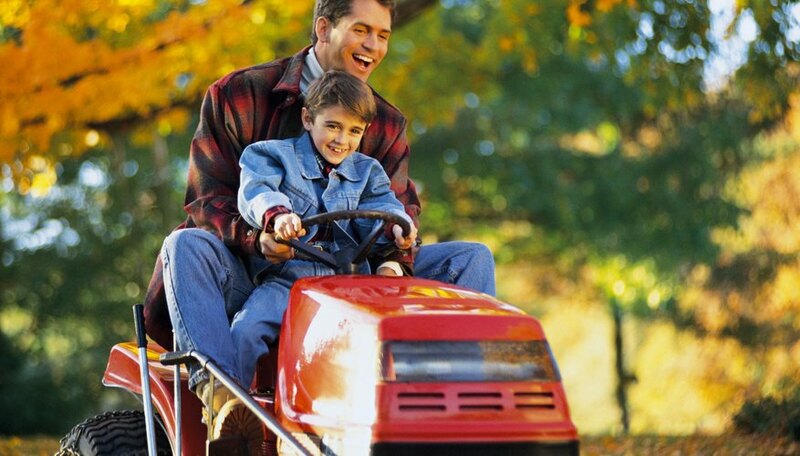 Installing an hour meter on a Sears lawn tractor will let you know how long the engine has run. This will help you schedule maintenance such as oil changes. The simplest meter to install is called a pulse sensor. It detects the ignition pulses that run through the spark plug wires to determine when the engine is running. These hour meters are usually battery powered. Choose a pulse sensor hour meter for your Sears lawn tractor online or check at auto parts stores. The meter should be designed to mount on the dash, not through it, so you won't have to cut a large hole to mount it. Hold the hour meter against the location on the dash where you want to mount it. Use the tip of the drill bit to mark the centers of the mounting holes. Move the hour meter out of the way. Drill a hole through the dash of the Sears lawn tractor at the location of each mark you made. To allow more room for error, you can use a drill bit slightly narrower than the mounting holes. Drill a third hole in the dash to run the antenna wire for the hour meter. Choose a location for the hole that will line up with where the wire leaves the back of the hour meter. Thread the antenna cable through the hole you drilled. It should enter from the front of the dash and pass into the lawn tractor's engine compartment. Attach the meter to the dash of the Sears lawn tractor using a pair of short machine screws and matching nuts. Tighten these with the screwdriver and a wrench. Coil the last several inches of the antenna wire in a tight coil around the insulation of the spark plug wire. The spark plug wire will be dark gray or black and about 1/8" thick. A thick rubber boot at the end of the wire will have a 90-degree bend that connects to the spark plug on the side of the lawn tractor's engine block. The antenna wire should be stiff enough to stay in place on its own, but you can strap it in place with one of the nylon cable ties. Use the cable ties to strap the antenna cable to the frame to prevent the slack from dangling in the engine compartment. Don't strap the wire to engine components that will become hot when the engine runs. Start the engine to test the hour meter. If it doesn't work, re-wrap the antenna wire, using more of the wire. This will help ensure the hour meter is getting a good signal from the spark plug wire. A few models of Sears lawn tractors have an hour meter option. A Sears parts center will help find an hour meter kit for your lawn tractor. It will fit into a pre-cut hole on the dash and plug into an existing wire harness. The kit will come with detailed installation instructions, and the parts center can print out a diagram if you need it. Some pulse-sensing hour meters have a two wires that share the same insulation. The antenna wire is usually colored red. If there is no red wire, check for a wire with a metal end or connector. The wire with a metal end is a ground wire, not the ignition wire. Connect the ground wire to a metal part of the engine or frame, if your hour meter has one. The ground wire is usually white and should have a bare metal end or connector. Loosen a bolt enough to slip the connector or end of the wire in, then tighten the bolt. Make sure that the antenna wire of your hour meter doesn't come in contact with any hot parts of the engine or moving parts. Pay special attention to the exhaust and muffler. In 2009, Jonathan Ryan began writing design documents describing digital marketing promotions for clients such as Heinz Ketchup and Kellogg's. His work also appears on eHow. In addition to working with all things computer-related, he has experience with home improvement and auto repair. Ryan holds a Master of Science in computer science from Western Michigan University.